This is my first post here. I'm new to the 8mm world. I recently got my hands on a Bolex M8R. It is in need of repair and was wondering if anyone could help. There is a capacitor that is attached to the mains and the motor that needs to be replaced. If anyone is familiar with this projector could they possible direct me to a replacement? The values on the cap are 0.2 + 2 x 0.0012 uf. To me it looks like three caps in one (1 x 0.2 uf and 2 x 0.0012 uf caps). I have no idea how these are connected internally. The problem is that the motor is racing. Any advice on getting this beauty back in action would be very much appreciated. Thats the motor noise suppression capacitor. It is there to stop the motor interfering with other electrical equipment. Its clearly dead. You can replace it with a three lead motor supression capacitor or you can simply disconnect it. It wont make any difference to the projector. I'm not an expert so dont quote me on it, but this looks like a suitable replacement. The M8 gets very hot. The motor and lamp run at 120v and the european 240v supply is dropped to 120v by a huge coiled resistor behind the voltage selection panel. To prevent the projector overheating there is a mechanism which prevents the motor from falling below a certain speed. If you turn the speed knob down too low the motor will alternately slow down and race as the speed control mechanism cuts in and out. I really appreciate your help. Sure enough, when I turned the speed control up a little, the projector was as smooth as silk. I'm very green when it comes to projectors, this is my first delve into 8mm! I'll order that suppression filter and replace it. Thanks again for the help! Well I'm very glad that was useful. I've taken apart and cleaned the internals. Oiled and polished the lense (it was filthy!). It made a big difference to the lamp brightness. All I need to do now is get some film! Just wanted to say thank you for the questions and answers in this thread. Bought an M8 yesterday, got it home, plugged it in and it went bang! 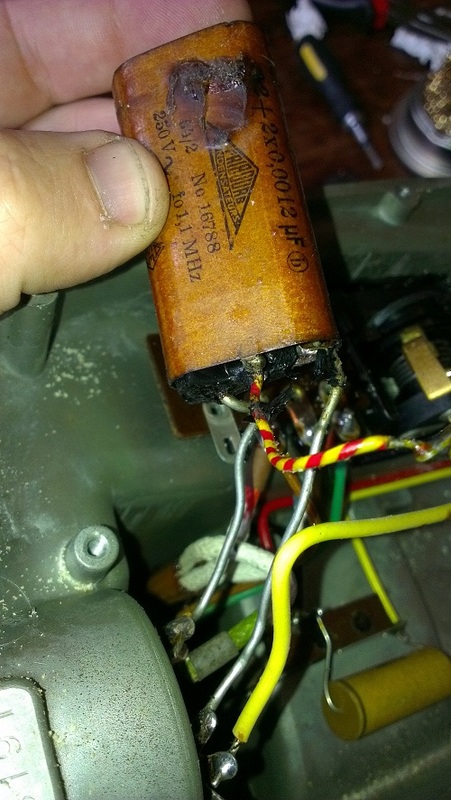 Discovered it was the capacitor that had gone, did a search on the Internet and found this thread. Removed the cap and the projector ran fine, today I bought and fitted a new cap and it is still working fine. Got the cap from Maplin as recommended. what do I have to open to access to the cap?